Patric Hornqvist's natural hat trick in the third period powered the Pittsburgh Penguins past the Colorado Avalanche 6-3 on Tuesday night. The Avalanche had erased a three-goal deficit to tie the game going into the third when Hornqvist went to work. Patric Hornqvist's natural hat trick in the third period powered the Pittsburgh Penguins past the Colorado Avalanche 6-3 on Tuesday night. The Avalanche had erased a three-goal deficit to tie the game going into the third when Hornqvist went to work. His power-play goal 6:11 into the final period gave the Penguins the lead. Hornqvist beat Semyon Varlamov again just 1:21 later to push Pittsburgh's advantage to two, and the veteran from Sweden completed the hat trick on his next shift when he fired a wrist shot by Varlamov less than 90 seconds later. Jake Guentzel, Evgeni Malkin and Derick Brassard also scored for the Penguins, who halted Colorado's 11-game point streak. Kris Letang added two assists for Pittsburgh. Casey DeSmith finished with 42 saves. Tyson Barrie, Carl Soderberg and Matt Nieto scored for the Avalanche, who saw their six-game road win streak snapped. Varlamov made 26 stops, but struggled early and late. Penguins captain Sidney Crosby and Colorado star Nathan MacKinnon, good friends and frequent training partners in the offseason, put together a thrilling duel in Colorado last week, with MacKinnon's four points able to help the Avalanche overcome a natural hat trick by Crosby in a 6-3 Avalanche victory. The two stars went scoreless in the rematch, taking a backseat to Hornqvist. The Penguins needed just 7:27 to build a three-goal lead. Guentzel redirected a feed from Letang with his left skate just 2:46 in. Malkin followed just over four minutes later when he jammed home a shot from the point by Tanner Pearson for his first five-on-five goal since Oct. 30. Brassard beat Varlamov 35 seconds later and Colorado's hot streak appeared to be in serious jeopardy. Pittsburgh then caught a break when a goal by Colorado's J.T. Compher was overturned on a coach's challenge when officials ruled Soderberg interfered with DeSmith. Still, the Avalanche managed to fire 18 shots at DeSmith in the opening 20 minutes, a hint at the flurry to come as Pittsburgh's seemingly comfortable advantage vanished in a span of 5:01. Barrie's power-play shot from the point 8:16 into the second gave the Avalanche momentum. 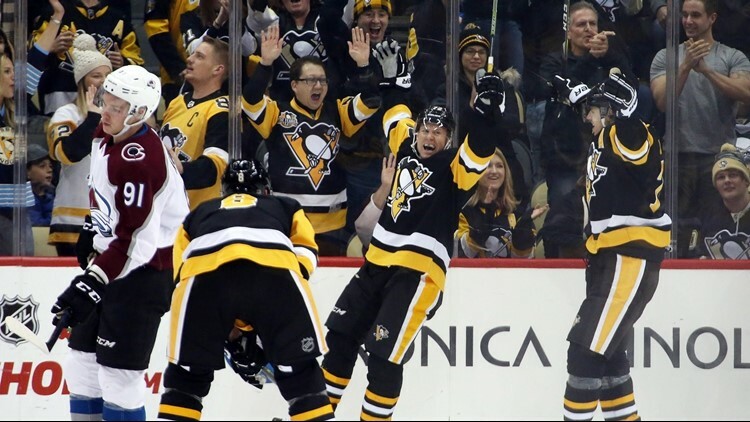 Ian Cole, playing in Pittsburgh for the first time since helping the Penguins win consecutive Stanley Cups in 2016 and 2017, fired a knuckler toward the net that Soderberg managed to get a stick on and deflect past DeSmith. Nieto found a gap with the Penguins on the power play to slip the puck by DeSmith to tie the game, the seventh short-handed goal allowed by Pittsburgh this season. Hornqvist, one of the best net-front players in the league, collected a Letang rebound, spun around and whipped a shot by Varlamov 6:11 into the third to start a burst that ended with hats raining down from the sell-out crowd, and Colorado's attempt to match the franchise record for consecutive road wins set during the 1998-99 season was over. Colorado: Begins a two-game swing through Florida on Friday when they play the Panthers. Pittsburgh: Welcome the New York Islanders on Thursday. The Islanders won the first meeting between the two teams this season in a 3-2 shootout on Nov. 1.